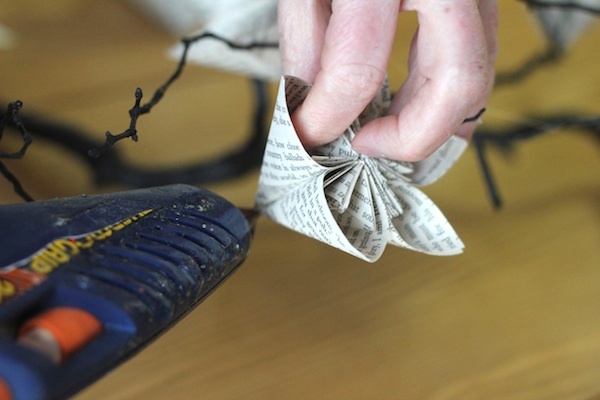 All this posting about using book pages has a point. I explore the blogger world for the same reason many of you do - to find inspiration- and this category is rich with possibilities. Today's project is the combination of ideas that came from three different posting series I have recently completed. 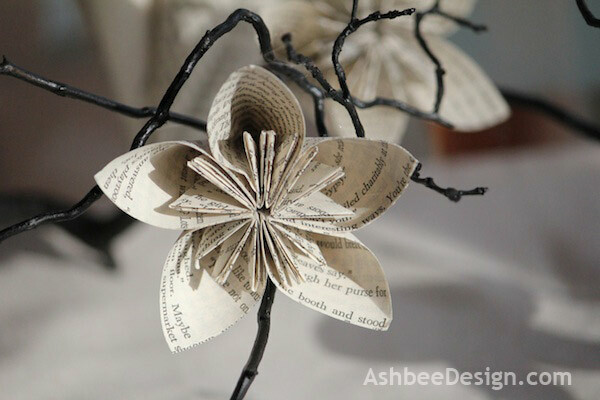 I used the flower concept from my map series, the material concept from the book pages series, and a branch from my endless branch series! 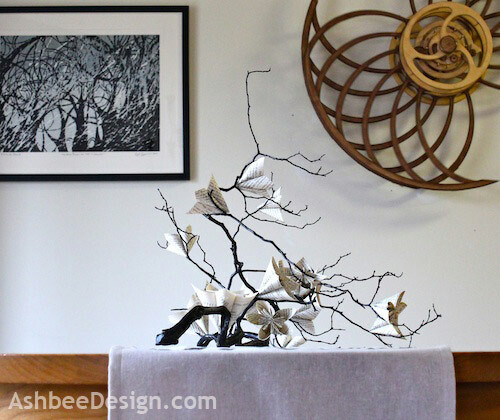 Together I created a new centerpiece that is reminiscent of the lively strokes found in Chinese brush paining. 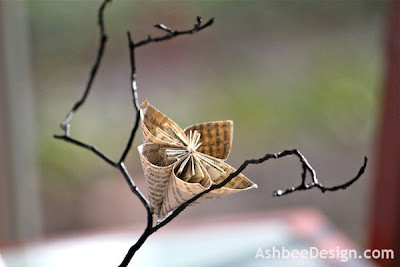 I made origami Kusudama flowers from vintage book pages and attached them to an old gnarled Mountain Laurel branch harvested during one of my daily woods walks. I love the results. 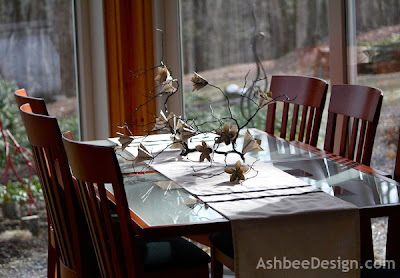 It displays beautifully on my dining room table and compliments much of the other art already on display there. The total design is stunning but so to are the individual compositions within the structure. The process of creating this arrangement was surprising simple. 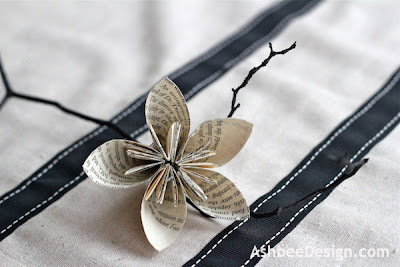 I started by disassembling an old book and using the pages to create the flowers. 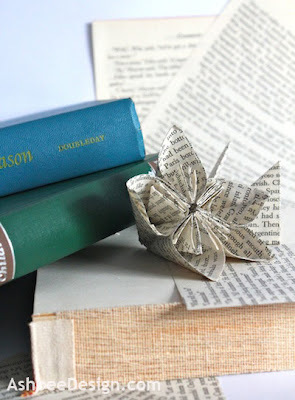 Easy to follow directions for an Origami Kusudama flower can be found here. I used paper cut into 3", 3.5, 4, and 4.5" squares to create blossoms of various sizes. It takes about 20 minutes to complete a flower. 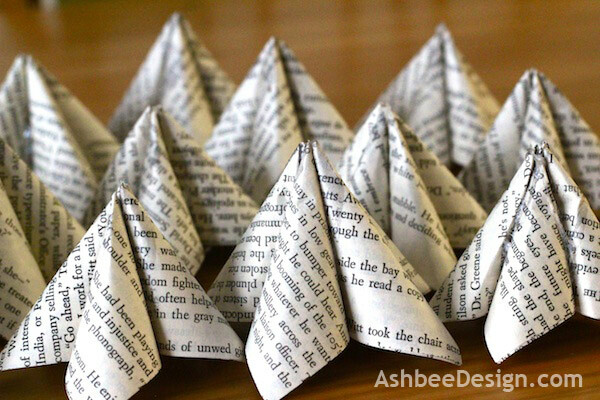 I kept paper around and would just create them to keep my hands busy while visiting with others. 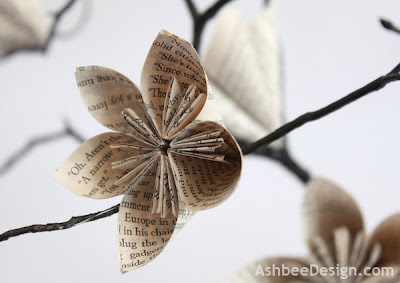 Meanwhile I selected a section of a Mountain Laurel branch from my collection. Mountain Laurel is a shrub that happens to be the Connecticut state flower. Although it thrives in abundance all around us, on our property it isn't doing well. The advantage is we have a variety of dead, twisted bushes that provide great material for this type of project! The size was regulated by the size of my table. I am considering making a smaller one as well to fit in the corner of a book shelf. The reality is that I can't keep all these tablescapes I am making yet some are so beautiful I want to use them elsewhere as decor. I used black spray paint leftover from my Woodland Sprites project to paint the branch. I debated keeping it natural but I like the black and white contrast. As always follow the label on the can paying attention to ventilation and temperature. The branch required many coats from many different angles. I continued making flowers as the branch dried. I always appreciate the photographic opportunities that mass production creates. 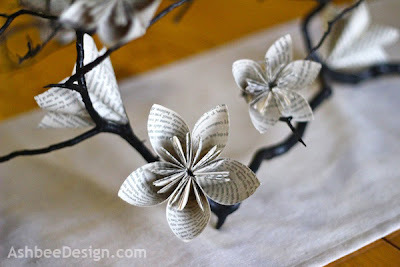 Once the branch was dry and the flowers were complete, I used a glue gun to attach the flowers to the branch. It required at least two points of contact for each flower. I worked to provide a visually pleasing spacing among the branches. Not too many, not too few. I knew I didn't have the appropriate table runner in my collection so I decided to make one. 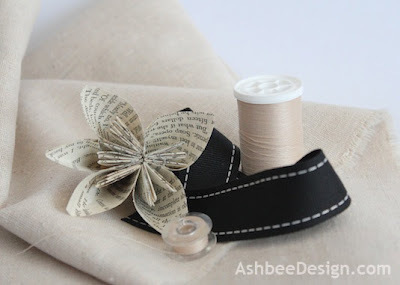 I purchased a natural blend fabric and some black trim at JoAnne's. I knew I would need the trim to hide the seam as I pieced the fabric together. I especially liked the black trim with the off-white stitching along the sides. I sewed a straight forward runner to use on my light ash table. I love the effect as it compliments both David's sculpture and Lynita Shimizu's woodcut both of which I have blogged about previously. I also set it up on the table in the sunroom. It looks great in both locations. Here in New England, although surprisingly warm, it is still not spring. We have no buds or flowers on the trees. 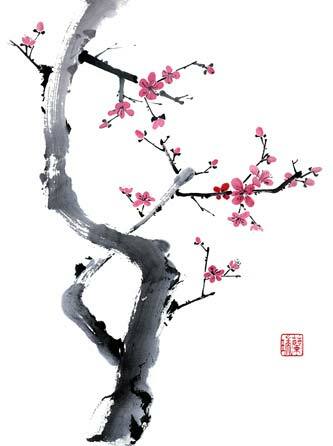 This project reminds me of the early apple or cherry blossoms that arrive later in these parts. Below is a sample of Chinese brush painting by Nan Rae that reflects a similar theme. See the similarity? 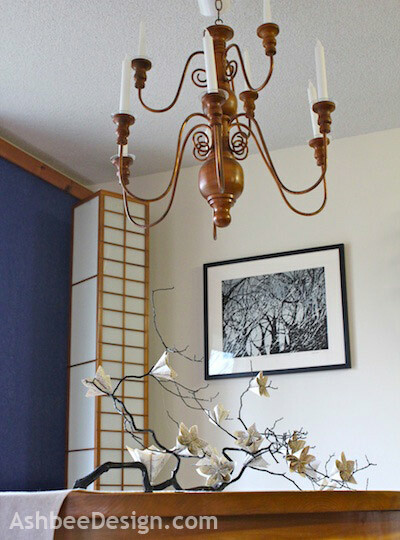 Uncommon Design - Featured Project! They are pretty, these flowers also look really nice if you use old map paper!! What a lovely flowers. I found your lovely blog at Not just a housewife link party. looks great! i love to see people make things with books and book pages. This is just so inventive and beautiful! You are quite a talented girl! Thanks for sharing at our Uncommonly Yours link party! Have a great week! Beautiful! Homemade table runners are so much better than store bought! Now you can make one to fit any occasion. Gorgeous!! This is so cool! 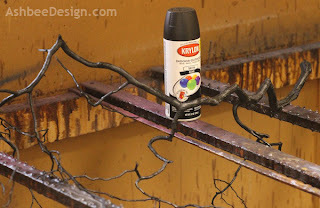 Come link up to my Centerpiece Wednesday party on my blog and show off this idea. Really nice job. So delicately beautiful. Wow, this is so pretty. Love it. I would love for you to visit My Dream Canvas. Thanks Anu. so beautiful.love the paper flowers.great work. Thank you to everyone for taking the time to comment. There is no doubt it inspires. I am still playing with the book pages but haven't landed on new project yet. I'll keep you posted. Just wanted to let you know that we will be featuring this at our link party this week! It opens tonight! This is such a beautiful idea! I love your table runner too! Visiting from A2D! This is AMAZING !! 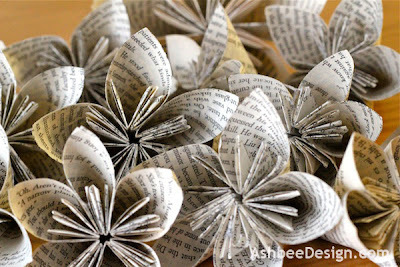 Can you please direct me to the tutorial so that I can learn to make this specific flower -- I have searched and searched online and cannot find instructions for the flower you have used in this centerpiece! Thanks !! Here is a link for the flower directions: Click here.